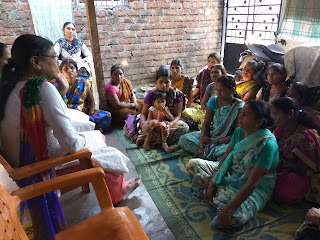 13-Feb-2018, Chinchwad (Pune): The Don Bosco Development Society (DBDS), Chinchwad organized a health awareness session for the women residing in the Khadi Machin slum in Chinchwad. 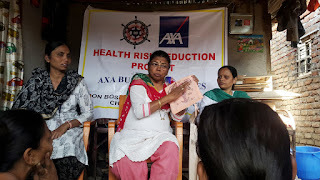 16 women participated in this programme held under the aegis of “Health Risk Reduction Project” supported AXA Business Services. 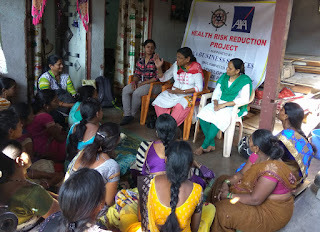 The objective of the programme was to educate women on health, hygiene and health risk behaviour. Ms. Lalita Chaudhari (Coordinator- DBDS) introduced the resource person and about the agenda of the session. Dr. Pratibha Lokhande (MBBS) was the resource person for this workshop. In the first part, she educated women on the physical and mental health and its relationship to sanitation. As the participants were young she adopted life cycle approach in her session. This session also educated them on reproductive and child health. In the second part of the session, she spoke about the safe and effective birth control methods. After that she covered topics on risks of consuming tobacco. 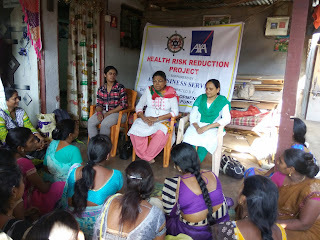 This included educating them on the harmful effects of tobacco on body and mind, oral cancer, lung cancer and many more health problems associated with it. 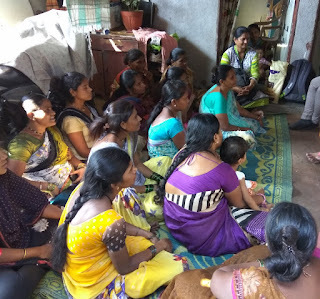 This was followed by question and answer session in which ladies asked many questions related to their personal and child health and chewing tobacco. Mrs. Rajshree Deshkhaire (DBDS -Staff) did the logistical arrangement for this workshop and organized women to participate in this event.